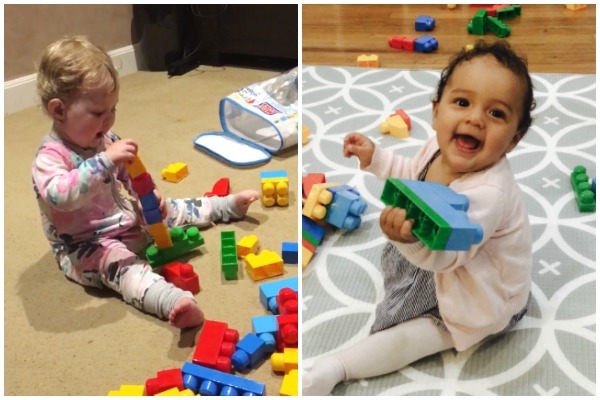 Blocks are one of the most sought-after toys for toddlers so we recently asked a panel of 19 mums (and their 19 one-year-olds and older siblings!) to review the Mega Bloks Big Building Bag. Here’s what they had to say. With 100 per cent of our mums recommending the product and an average rating of 4.6/5, the Big Building Bag is certainly one to add to the toy list. What’s better than watching your child squeal with delight when discovering a new toy? How about knowing that it’s also helping develop their cognitive and fine motor skills? That’s just what our Babyology mums experienced last month after agreeing to review the Mega Bloks Big Building Bag. 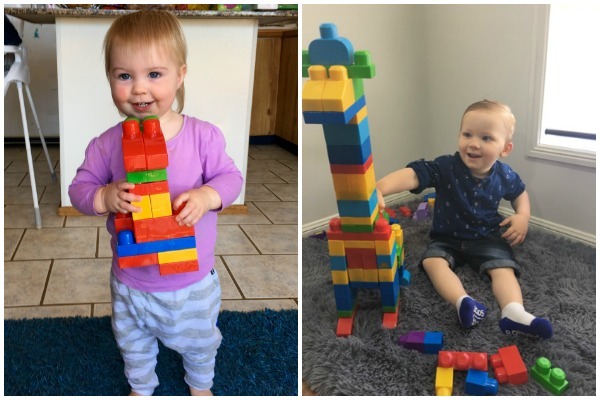 From “clapping and squealing” to playing “babies” with the blocks, it’s clear these kids had a blast with their new toys. 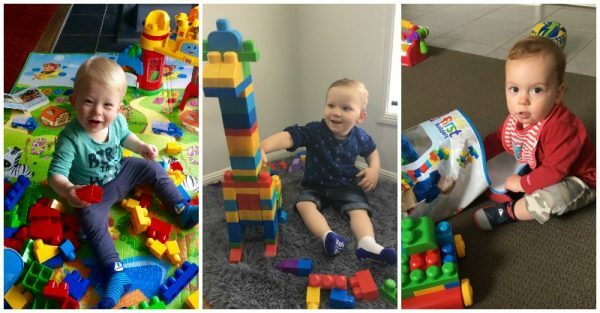 “Parker loved to push it around like a car and his dad built him a dragon on the base and they wheeled it around the floor,” Kristy tells Babyology. 18 out of our 19 mums agreed that the Mega Bloks Big Building Bag stimulated imaginative play and the same number gave it 4 or 5 stars. 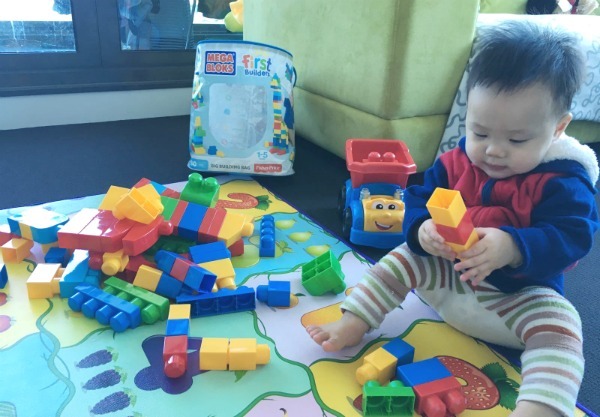 All of our mums said they loved watching their little ones play with the Mega Bloks and loved joining in and all of them would recommend the Mega Bloks Big Building Bag to friends. Each bag comes with 80 colourful blocks that are compatible with all Mega Bloks builder sets including the Scooping Wagon (which also met with incredible reviews from our readers). 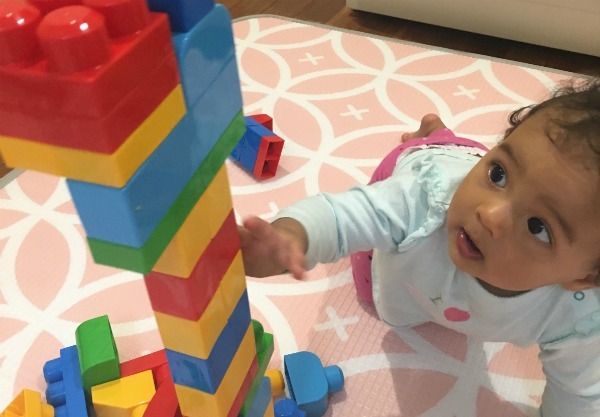 The blocks are the perfect size for little fingers and are easy to connect and use to build. “We’ve found that this has really helped with her cognitive motor skills over the past couple of months,” Selina said. Having the storage bag helps when it comes to clean-up time and even little fingers can easily learn how to pack up after playtime. “I just love the tidy bag that it comes with!” Samantha raves. Perhaps what most stood out for our reviewers was how this toy brought families together. Siblings played quietly together. Parents enjoyed building with their kids. And our panel of reviewers were able to get things done around the house! “I enjoy seeing both my children playing together. Their play is sometimes limited with toys as there is a five year age gap between them,” Ashlee explains. But her kids would happily sit together and enjoy quiet time as a team. As any mum with a toddler knows, toddlers get into everything! It can be tricky to keep their busy minds and active fingers engaged throughout the day. The Mega Bloks Big Building Bag has you sorted with a box of colourful fun that your little one is allowed to dig into (unlike that big bag of flour in the pantry…). Pick yours up from Target for just $25.